Why Select Sggreek for Digital Marketing Services in Lucknow (India)? We being the leading digital marketing company in Lucknow, aims to work on behalf of other business that guarantees the business to achieve their marketing goals. With our optimum service, we try to expand the presence of the brands on all the online platforms. By delivering the tip digital marketing services in Lucknow we use to design, growth strategy and insights that drive the business to its core value. Sggreek provides full-time digital marketing services so that we take our full time to understand the core value of your business. With our digital marketing solutions, we offer affordable social media, SEM, SMO, PPC, web design, graphics design, facebook banner design and SEO Services in Lucknow to offer a high customer level experience that stays within the budget. Our digital marketing company Sggreek can also help you to manage your company’s reputation in all the social media platforms. We are well known and highly renowned providers of Website designing service, SEO, Social Media Marketing Services in Lucknow India. Sggreek is a renowned and Top Digital Marketing Company in providing the best SMO, SEO services with digital marketing services to the clients that are situated throughout India. Since our inception, we are providing the services to large corporations and individual companies to give them the best marketing services that can help them grow in a better way. We have a team of smart, experienced and highly qualified people that makes us the best in our work. Our expert knowledge, practice and study on implying the latest technology to provide the support, improvements and strategize according to for business are always top-notch. What is Digital Marketing and why it is important for Your Website? At Sggreek, we understand that your business is your very first priority. With our online marketing services of SEO, SMO, PPC and ORM we help the business to grow in bounds and leaps. Our, SEO Company in Lucknow offers a range of customizable salutation that has helped our clients to reach into the untapped markets that are associated with their business. The highly skilled and professional SEO experts optimize the business websites in a way that the website responds the highest ranking in major search engines like Google, Bing and Yahoo. All our search engine optimization Services in Lucknow, activities are done to ensure that the websites are ranked higher in the organic searches. Our Social Media Optimization Services in Lucknow, The Team of social media platforms are said to be the new driving force in the internet market that an online business cannot afford by keeping it ignored. In which, the SMO plays a crucial role by giving a perfect platform that reaches to the targeted audience firmly, and that also allows to communicate with the potential clients directly without any hassle. Sggreek is offering the top PPC Services in Lucknow, India as well as we can also manage the Pay Per Click campaigns even in the low size budgets f our clients. We work the PPC campaign management services Lucknow for our clients in a way that the investments are initially low but the return on investments will be really high. We handle the PPC campaigns for Yahoo, AdWords and Adcentre. We can help you to draw traffic to your website in a cost-efficient way. With our Online Reputation Management Services in Lucknow, India, you can repair or build your online reputation services with our highly compatible ORM service. The online reputation management (ORM) helps to give a professional image to a company that helps to succeed. Since we have started our operations, we have also challenged us in developing mobile applications and web designs to give an indelible print of designs to our clients. We have become a quite reputable industry by excelling in all the seamless and comprehensive range of delivering mobile based solutions to develop a great website that can be operated in all the verticals. We build the mobile applications for a business that are based o the latest technologies and in the best possible solutions for our clients business. Our Web Development and Graphics Design Services in Lucknow aims to bring ideas that come alive with the web developments solutions for a business. Sggreek offers website development to carve perfect and creative websites that engage both mobile and desktop devices. We can create both static and dynamic website by using the latest frameworks. We are the specialist in Social Media Marketing and Ranking of E-commerce Website Easily. The social media works as a marketing tool for the growth of a business. When it comes to building customer it is not that easy to reach to the targeted customers by using social media. Well, if you own a business and you are looking out for a related social media management company at Lucknow, we are here to rescue you. Social media platforms can boost your SEO rankings in sites and in major search engines too. Social Media can help one to get noticed in events and in media coverage. Social media can help to drive the targeted traffic. Users are receptive b seeing the posts in social media platforms. As, we have seen the business world is totally reliable on social media, and by building a strong presence in social media platforms a business can accelerate its growth and performances. By hiring us as a Top Digital Marketing Company and leading SEO agency in Lucknow we can professionally help you to manage your business channels by increasing the engagements that lead to the growth of your business. We will manage it by keeping your websites updated on behalf of your organization on major social media platforms like Instagram, facebook and twitter. The Sggreek understand your business priorities and the intensity on how much you want to achieve your success with online promotions. Our social media strategies are totally based on the observable metrics that help you to answer the needs of a potential customer that delivers the content. We help to create the most maximum output with our unique content. Well, the digital platform is being used by the managers that engage, attracts and convert’s the users into the customers. Sggreek has leveraged the position in the field by carving out the most effective, easy and efficient Lead Generation services in Lucknow that can help a business to build its own empire. We post contents of business on the social media platforms to interact with the potential clients. The goal of each post is to engage the followers on a consistent basis that can help them to create loyalty and visibility of their brand. We also work closely with our customer to make sure they are satisfied with our professional work and commitments on time. We understand that every company has their own sets of requirements within a budget, and we believe to make their work easy by customizing the services according to the budget that can suit the client’s needs. 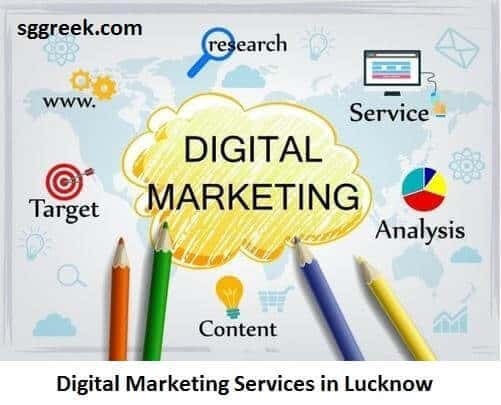 The major reason which makes us the Top digital marketing company in Lucknow is that we offer our services at the post-pocket-friendly prices. Our clients also enjoy our extensive range of expertise in delivering their services. We also offer a wide range of tailored packages that covers all social media platforms and digital marketing techniques to grow a business online presence. We also create brand loyalty and visibility to increase the traffic to one’s website to engage the followers. So connect today at Sggreek, for your digital marketing needs.